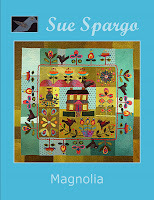 I am delighted to have the book for Magnolia back from the printer. 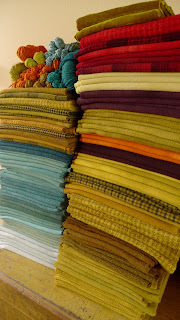 This was such a fun quilt to make using Wendy’s wonderful palette of hand dyed wools. If a large quilt seems overwhelming you can always do a block and make it into a table runner, pillow or small wall hanging. 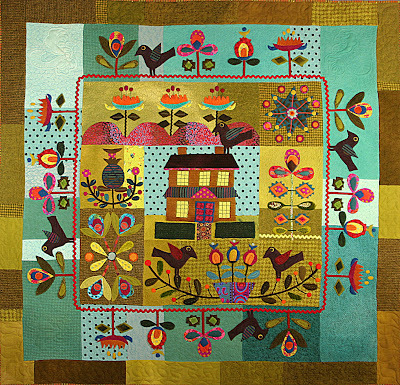 I would also like to share with you a quilt made by Nancy Moore from Montana using my CD ‘Folk art Dreams’ from the Electric Quilt Company. This is a fabulous CD with 190 of my blocks on it. You can see how you can create and design your own projects. This pillow was also created by Lynn Cibulka using blocks in the CD. I just love to see all the possibilities using blocks I have designed. 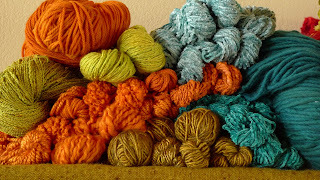 I always think of them as a springboard to making your own one of a kind pieces. 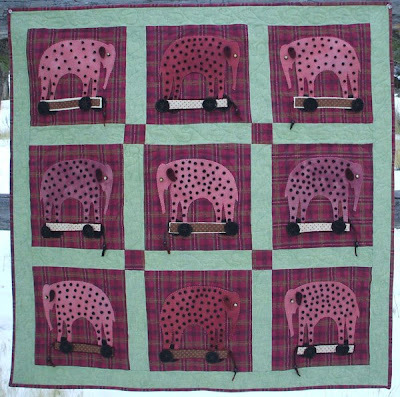 Many thanks to all my students who share their quilts with me. This week was Jason’s first volunteering session at the hospital and he very bravely chose the 9 – 12 pm slot in the emergency room. I did hear him come home late last night so he made it through. I suspect he will be sleeping through the morning and will have good stories to tell when he stirs. Good on ya mate! He also learned to dye wool this week and was big help to me as I finally managed to get all this shipped before the weekend. It is all for the wonderful kit Magnolia. You are all one step closer to getting the goods, enjoy! 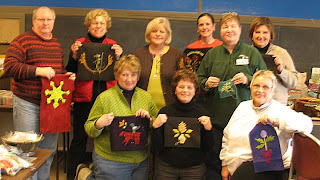 What a fun group at Capital City Quilt Guild in Lansing, Michigan. I taught for two days and was inspired by all the wonderful projects they were working on. They all chose different patterns and kits and personalized each of their own pieces. 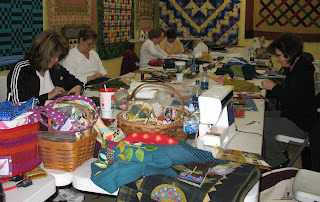 I then traveled to southern Ohio and taught a day workshop at Appalachian Quilts. It was great to meet new people and see some of my old friends. 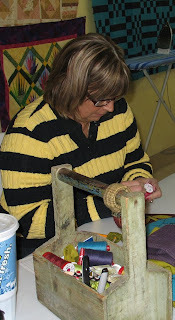 They worked on the Thistledown table Rug as well as the Greenbrier Quilt. I stayed with my friend Trixi. It was fun to meet her family and hunt around the local antique stores. I travelled on to see Alice from kindred Spirits. 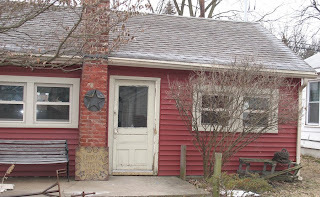 I was fortunate to be there the weekend she was moving her studio and store into her renovated cottage at her home. What a wonderful place she will have! We also worked on the details for our Workt by Hand retreat May 5-7 this year. I am very excited about the project and delight to say we are nearly full. We only have 5 spots left! I have been working on many projects for publication as well as writing books for market. I will be writing about these in the next few days.